1. I have an A/V receiver rated to drive 8-ohm or 6-ohm speakers, but a home theater system I'm considering has a 6-ohm center speaker, 4-ohm main speakers and 6-ohm surrounds. How do I match the impedances? You do not have to match speaker impedances! A 5.1- or 7.1-channel A/V receiver contains up to seven separate amplifiers, each one assigned to a specific speaker in the system. So each amplifier only sees one impedance per channel, not five or seven. 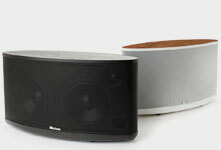 The respective speaker impedances of the other speakers and channels don't need to match. 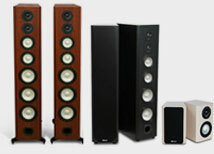 Many A/V receivers will easily drive a pair of 4-ohm front speakers, a 6-ohm center channel, and two pairs of 8-ohm surrounds. Speaker impedance has nothing to do with sound quality. It's an electrical characteristic. 2. My new house came pre-wired for ceiling speakers. Can I use those for my surround speakers? You can, but you won't get anything like the enveloping surround effects and the precise directional cues originally conceived by the movie director and the film sound designer because the effects channels are intended to go on the side walls, just like in a big cinema. Dolby Digital and dts 5.1-channel movie soundtracks are mixed with the surround speakers to each side of the mixing studio about 2 feet or more above ear level, in order to imitate the enveloping sound field created by surround speakers on the side walls of movie theaters (plus a couple on the back wall behind you). Axiom quadpolar QS8 and QS4 surround speakers use four drivers each to mimic the envelopment created by banks of surround speakers on a movie theater's side walls. 3. My Sony Playstation has a standard RCA video output, but my new TV only has S-Video inputs. If I get an RCA-to-S-Video adaptor, how much improvement can I expect in picture quality from the Playstation? You'll get little or none. Adaptors that convert a video signal from a composite connector (a single RCA plug, usually coded yellow) to S-Video cannot add detail to the incoming video signal because the signal is already degraded in the source component (your Sony Playstation). Likewise, S-Video-to-Component-Video adaptors are limited to the inherent quality of the original S-Video signal. The adaptors are a convenience, so you don't have to run a variety of different cables, or in your case, to let you feed your Playstation video signal to your new TV's S-Video input. Up-converters or video scalers (by Faroudja, Silicon Optix, Genesis and others) found in some new A/V receivers may add a more filmic look a smoother picture free of scanning lines and video noise—but actual detail cannot be added. 4. I don't want to be bothered with a subwoofer. Can't I get big floorstanding loudspeakers with good bass response instead of a separate subwoofer? The increased deep bass output from a well-designed floorstanding speaker will usually give you an extra musical octave of bass coverage over that of a small bookshelf speaker, typically extending the bass from about 60 Hz down to the 30- or 35-Hz region, and that's enjoyable and important. 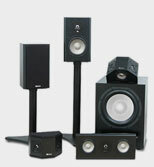 But all floorstanding speakers quickly lose output and extension below that frequency. And that's exactly where many of the really powerful movie soundtrack effects begin some go as low as 13 Hz— which is why a subwoofer will bring more impact and clout to a home theater system's low-frequency special effects and music score. 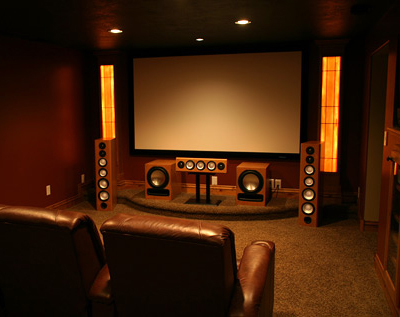 There is another downside to using only two front tower speakers without a subwoofer or center channel: Dolby Digital and dts movie soundtracks and multichannel music recordings are mixed with low frequencies dedicated to the subwoofer, and midrange dialog or vocals intended for the center channel. While this material (six channels) will be mixed down by the DVD player for 2-channel playback (if you remember to correctly set the DVD player), you will inevitably lose some of the clarity and extension of deep bass as well as the precise directional cues of center channel information. By contrast, a powerful subwoofer will add much realism to all sorts of music, whether it's the driving bass of a rock band, the percussive impact of orchestral bass drums, or the clout and slam of a great bass solo in a jazz group. It's not just about the lowest frequency, either. 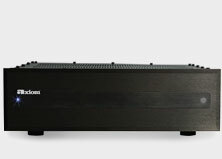 A sub is also about sheer power: a large woofer in its own big enclosure powered by a 200-watt amp (or larger) and dedicated only to producing powerful deep bass takes the load off the rest of the system's woofers, thereby reducing distortion and enabling cleaner, louder playback levels. Deepest bass is produced with better precision and slam (impact). 5. Do I have to make all the speaker cables the same length for each speaker in a 5.1-channel or 7.1 surround system? No. This is another myth perpetrated by retailers to sell you more overpriced speaker cable than you require. Just use the length of cable you need to conveniently reach the speaker from the amplifier or receiver. There are no electrical or acoustic benefits to making all the cables the same length. If you use 12-gauge copper speaker cables, the resistance will be electrically insignificant even with long cable runs of 50 feet or more. Don't underestimate how much you may need, of course. You may have to snake the cable under rugs and behind furniture, so measure the distances beforehand or buy a bulk supply, e.g. 100 feet, cutting off the lengths you need to reach each speaker in the system. 6. What's the big deal about surround sound? For my purposes, I don't see any benefit. My entire 500-CD collection is 2-channel stereo and I hardly ever watch DVDs. Simple stereo is OK by me, so why should I pay for a 5.1 channel surround system? It may come as a surprise, but hidden in those two stereo channels on many of your CDs is lots of directional information that the original microphones captured but you aren't able to hear in stereo. In the same way that our two ears and a brain interpret sounds from all sorts of directions around us, many 2-channel recordings have what's called out of phase information that the two or more microphones pick up. But those signals are largely ignored in stereo playback. A 5.1-channel home theater surround system will extract and decode the out-of-phase directional cues and ambient sounds and route them to the surround speakers and the center channel reproducing the relative spatial and timing cues. In effect, it reproduces a more realistic soundfield of the original recording. Lots of CDs in your collection may benefit hugely in realism when played back through a modern Dolby Digital, dts, or Logic7 surround decoder. Discs of live pop, rock and concert recordings, jazz, classical works, opera, and plenty of vocal albums will sound much more realistic, with enhanced depth and spaciousness. Not every recording benefits, of course, but a great number do, and there is nothing phony or artificial about the process. The decoders used are called Dolby Pro Logic II (and its latest version DPLIIx), dts Neo:6, or Logic7 (the latter is only offered on H/K and Lexicon equipment). Besides, if you are really married to stereo listening, you can always turn the surround off and listen in stereo. You are not compelled to listen in multichannel surround sound, but you may come to love it! 7. I'm laying out plans for a new house and I want to set up a home theater in a dedicated room in my house or in a family room. How much should I budget for video, audio and other components? Decide how large a room it will be how many viewers you might want to seat because the larger the room, the bigger the speakers and amplifier/receiver you will need to fill the space with high-accuracy clean sound as well as the larger the big-screen TV display will need to be. Let's take a typical example: a room that's 20 feet long by 14 feet wide with a normal ceiling of 8 feet. The viewers might be seated 12 to 16 feet from the TV display. If you are satisfied with DVD clarity and resolution (480 lines progressive, known as EDTV), excellent front DLP projectors that throw a huge wide-screen image (120 inches diagonal) viewable over a wide area can be had for $1,500. (For front projection, you must have a room that can be made completely dark for the best image clarity.) 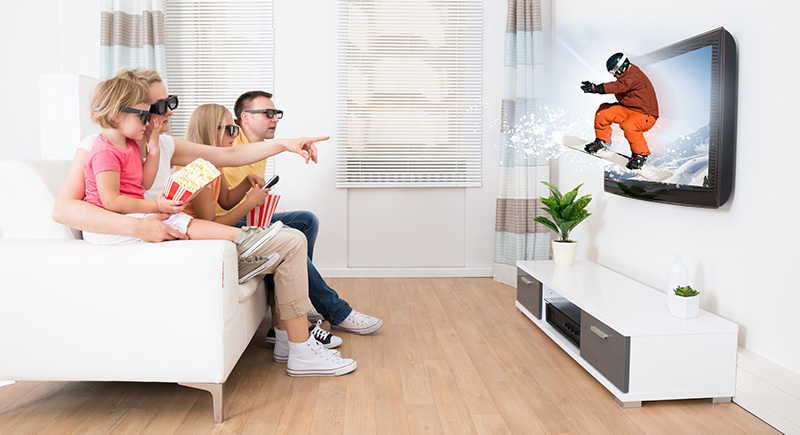 True High-Definition image clarity (HDTV) from a front DLP or LCD projector costs more—$3,000 and up. Allot from $2,200 to $3,500 for the HD display (a 50-inch diagonal DLP or LCD rear-projection HDTV), about $2200 for the surround speaker system (the latter based on an Axiom Epic 60/350 5.1-channel speaker system) and perhaps $600 to $900 for the A/V receiver. A budget system in a smaller room (2,100 cu. ft or less) might typically cost $1600 for the surround speaker system, $1500 or less for the HDTV (a CRT rear-projection or direct-view set), and $350 or more for the A/V receiver. A progressive-scan DVD/CD player is about $80 to $150. Axiom's archives are filled with details on setting up rooms. 8. I'm not technically adept, so setting up a simple stereo system can be challenging. How can I cope with the intricacies of a 5.1-channel surround system? Most A/V surround receivers have factory settings that you can access or default to if you're confused. Those will get you up and running in 5.1 channels with the subwoofer, and you can refine the relative balance of each channel as you become more familiar with the receiver, its menu and its remote control. Many new A/V surround receivers are including automatic setup systems that calculate speaker size, speaker distances, delay times and the correct loudness levels for each channel. While great in theory, some of the auto setups may be problematic, especially if they attempt room equalization and/or phase settings. However, each year brings new surround receivers that are easier to use with more accurate auto-setup modes and they are often less expensive than earlier models. Personal on-line help is also available from some companies (Axiom). 9. Which type of High-Definition TV is best? There seem to be so many new technologies to choose from. What do you want from a new TV display? Do you want to watch it in a darkened room on a really big screen that simulates a real movie theater presentation? If so, look at an LCD or DLP HD front projector they are compact and relatively affordable ($3000 and up for true HD; $1500 or less for EDTV DVD resolution). You would also need a separate screen, which will add to the cost. Or would you rather watch in a lighted family room? If the latter, then look at a flat-panel plasma if you want the screen 42 inches or larger. Plasmas will deliver an extremely bright image, viewable over wide angles in a brightly lit room. In HD versions, they are expensive, about $3,500 and up. If you'd like a smaller screen, under 42 inches diagonal, then LCD is the way to go. They are also quite bright, less expensive than plasma, and viewable over quite wide angles. Neither of these technologies produce quite as much contrast and deep blacks as you can get from a DLP rear-projection set, but you won't get a DLP in a flat panel. They occupy more space the thinnest are typically about 14 inches deep. Nevertheless, these are capable of excellent HD performance and currently are much less costly (in equivalent screen sizes) than plasma or LCD panels. DLPs in 46-inch diagonal screen sizes start at $1800, moving to $3100 for a 61-inch diagonal. The best LCD rear-projection sets are also very close to DLP, if not quite the equal in contrast and deep blacks. At a budget level, if you can accommodate the bulk (from 24 to 30 inches deep) and weight (200+ pounds) of CRT (tube) direct-view or rear-projection sets, those start at $1,000 and are capable of excellent picture quality.